If you've followed my work in the past, you may know that a favourite subject matter of mine is collections. I've drawn collections of keys, badges, matchboxes, pens, buttons and souvenirs to name but a few. 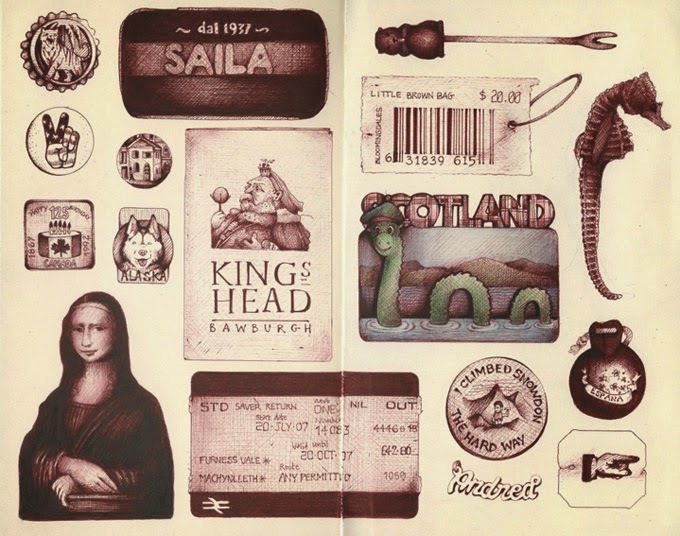 I've drawn souvenirs of all kinds, like in the drawing above, which comes from an entire sketchbook of collection drawings. 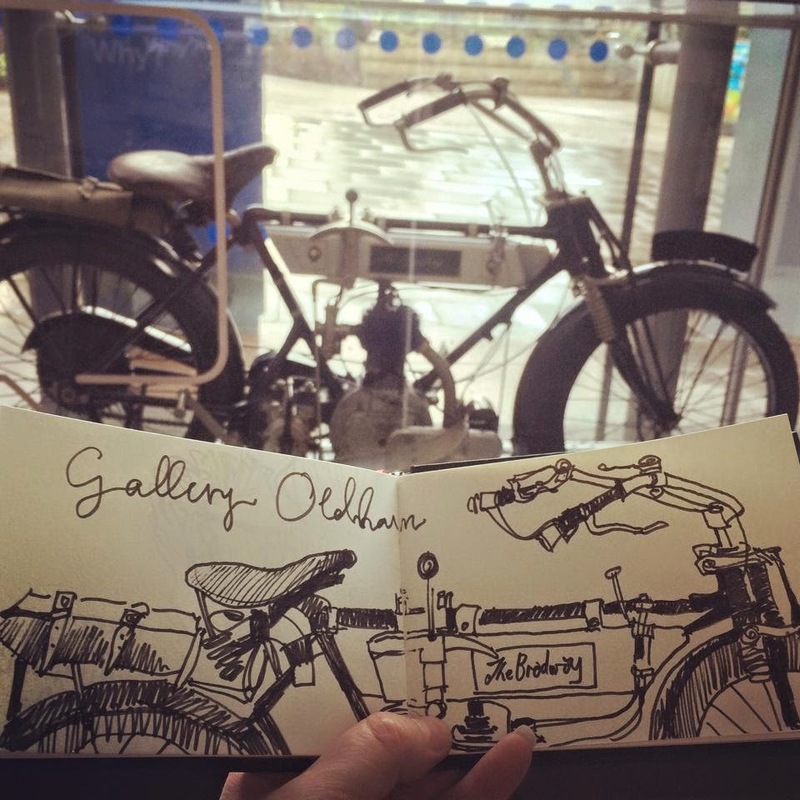 Well, recently I've been commissioned by Greater Manchester Museum Group to create four drawings based on their collections from four of their museums. I'm so thrilled about getting this gig. I've always wanted to draw museums' collections. I used to dream that I'd get a job cataloguing them all. It would be my perfect job, but unfortunately photography happened and then computers and so the call for museum collection illustrators and cataloguers waned. But, anyway, now I have the opportunity. 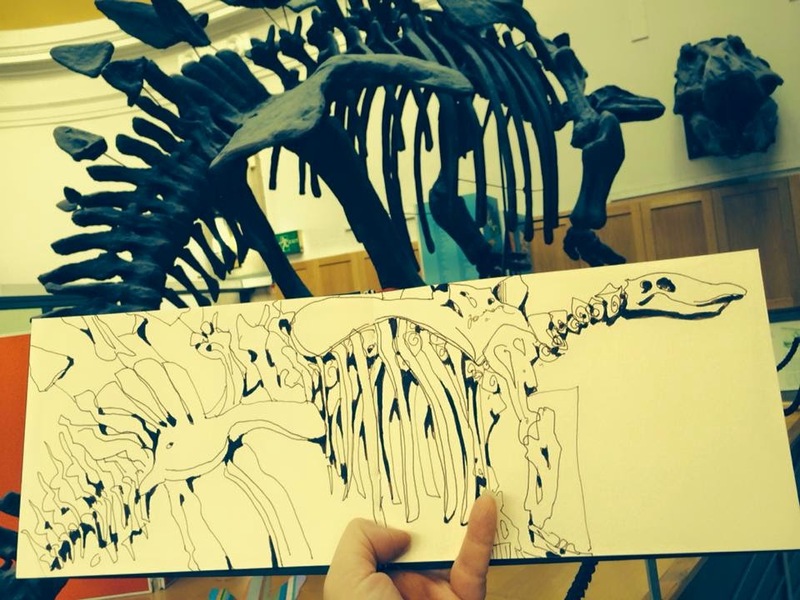 My problem is how do you make just one drawing from each museum? Well, firstly we narrowed it down by choosing the four museums from Greater Manchester's 21 venues. 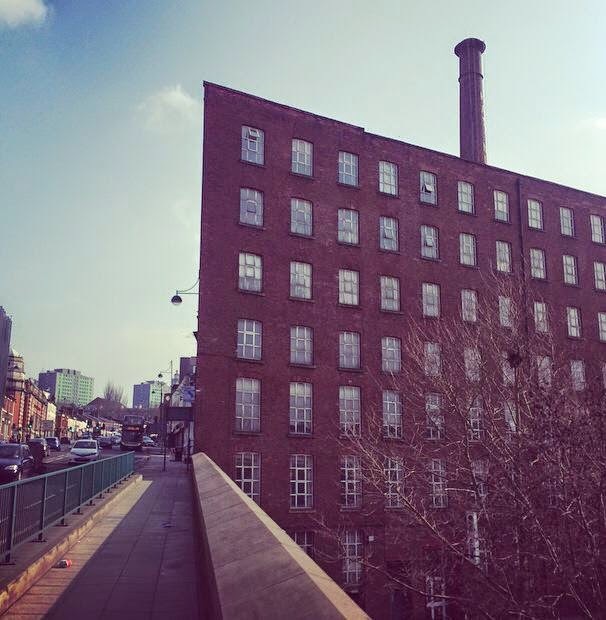 The first was Stockport's Hat Works Museum which is the building in the picture above. I already knew of, and love, this place. 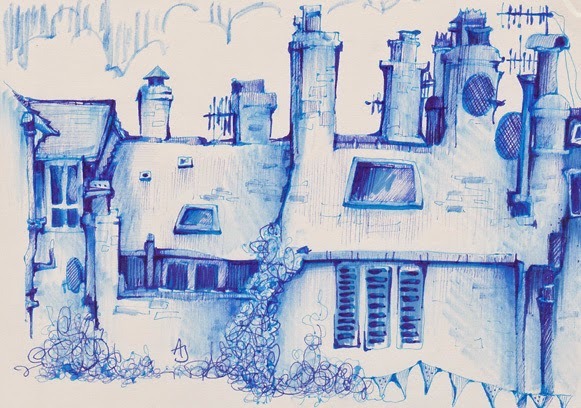 In fact we did a sketchcrawl there just a few weeks ago. It contains everything you need to know about hat making and the most amazing hats. But, not only do I get to visit the museums, but I also got the opportunity of looking through their archives and storage. 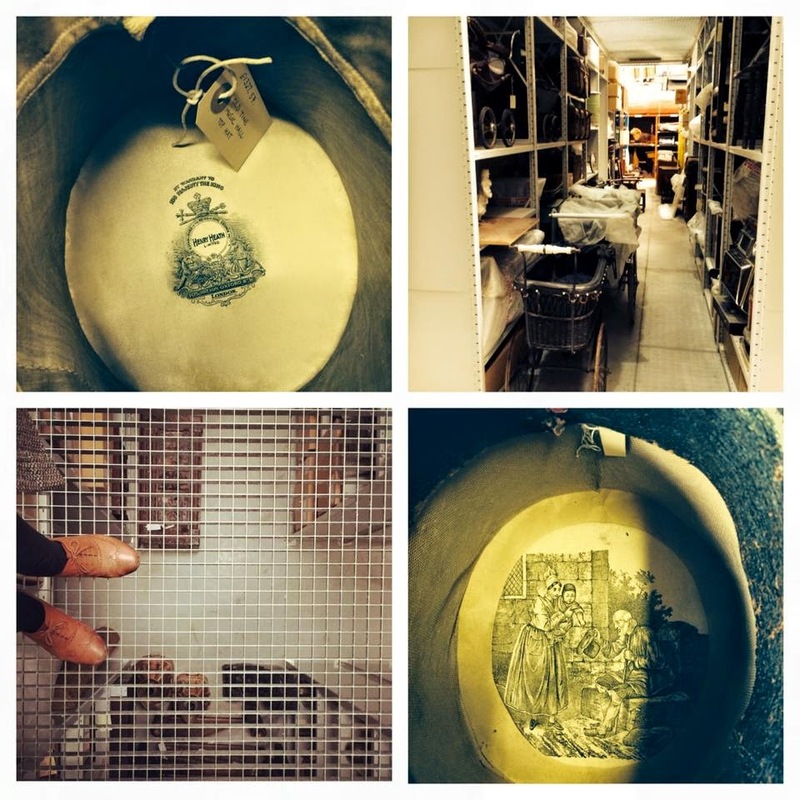 This has been such a privilege, rooting through the stores, holding history (and antique top hats) in my hands. The second collection I'll be drawing is the Egyptology collection from Bolton Museum. They have an impressive collection of Egyptology artefacts. Unfortunately, I didn't get the best photos from that trip but I did get a sketch of a dinosaur before I left the building! 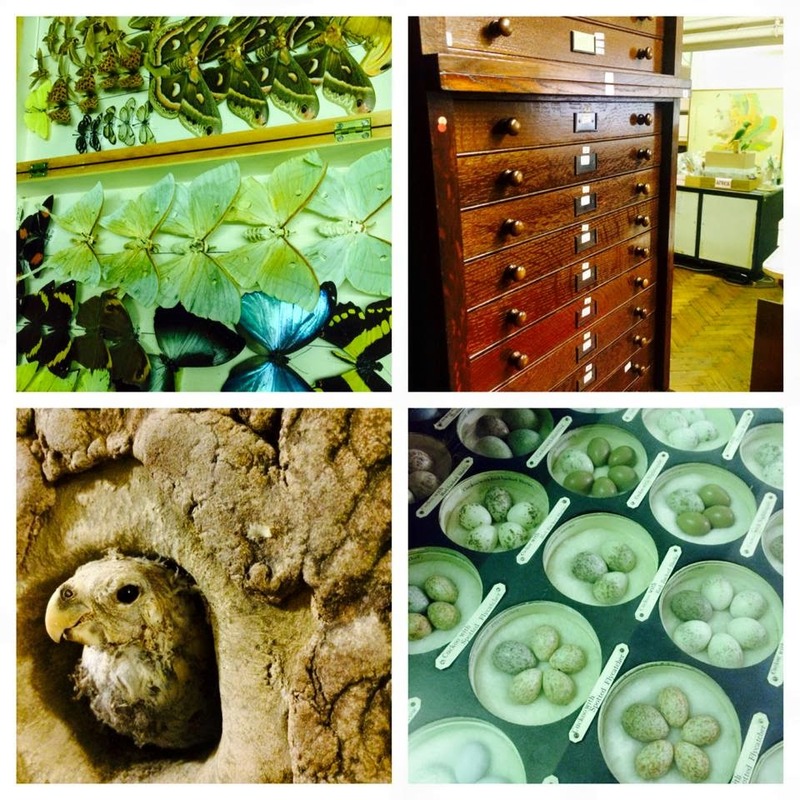 My third collection is from the natural History collections of Oldham Museum. I spent the best few hours with the curator, down in the cellar archives, surrounded by so many treasures of nature, whilst being educated on bugs and butterflies and birds nest. Actually, that too has been another joy and privilege of this whole experience, learning about, not just Natural History, the social history of this region and about the collectors. Learning from passionate people. Again, I managed to sneak some sketching in before leaving the building. Well, what else do you do when waiting for the rain to stop? Today was my final visit and final collection. For that I went to the Museum of the Manchester Regiment to view their medal collections. I wasn't quite prepared by how touching an experience that would be. I shed a tear or two reading the heart breaking stories of the soldiers who lost their lives. Oh, and unbeknownst to me, and quite coincidentally, this is actually Museum Week 2015. So Happy #MuseumWeek one and all. Go visit a museum because museums are great places. I've a few original artworks, in my Etsy shop, going cheap. The drawing above is brand new. I did it while waiting in the car park, in a local village, Hayfield, here in Derbyshire. It's the village where the BBC production called, funnily enough, The Village is filmed. Throughout the filming Hayfield was transformed into a village from 1914. Which basically means that they hardly did anything to it. It really hasn't changed much in a hundred years. You can find them both, and some others, HERE. 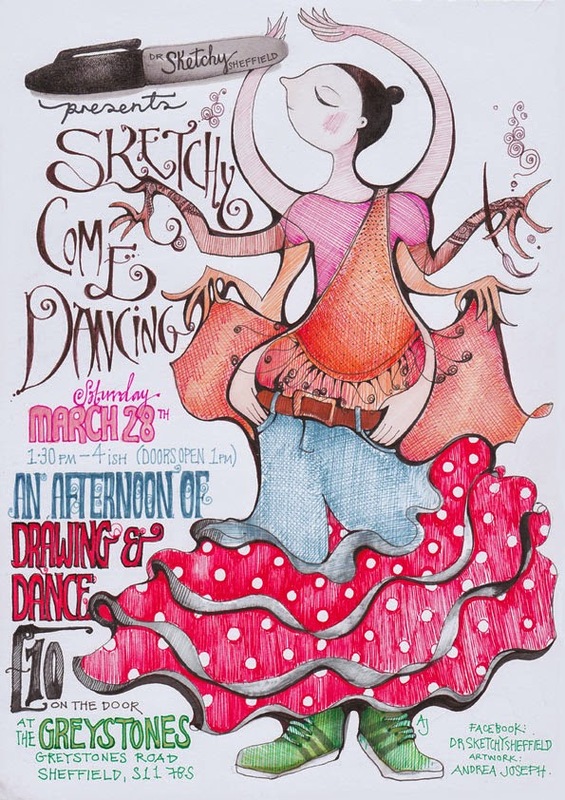 Amongst all the other illustration work I do, I also co-run Dr Sketchy Sheffield and, so, being the sketching half of the team (my co-running partner is from the performance arts), I create the poster artwork. 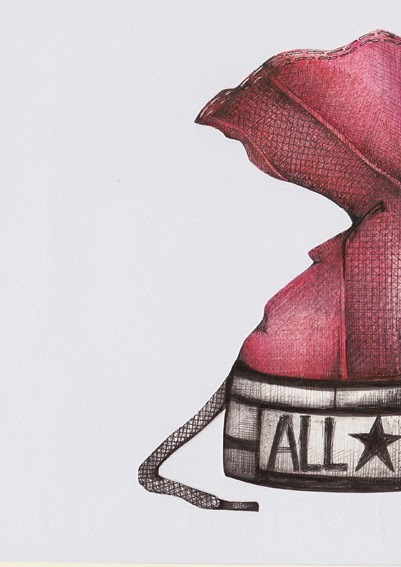 It's one of my favourite things to illustrate. Because it makes me feel closer to the poster artists, from days gone by, who's work I adore. I wish there were more call for poster artists. These days it's all done digitally so I like to buck that trend with purely illustrated posters (and I wouldn't have a clue how to do it digitally). Now once we've set our theme for our Dr Sketchy event the idea for the poster image pretty much comes to me straight away. Sometimes without even having to think about it. Really, it's just there. I see it - the whole poster - fully formed. I then just need to put it onto paper. Our next event (next Saturday, at the Greystones, Sheffield!) will be a celebration of dance. We have performers from different genres of dance modelling and, erm, dancing for us. We have a belly dancer, a breakdancer, a bhangra dancer amongst others. So, already I knew I had to get that info into the drawing. The first and original thought was of the kind of drawing in the image above. I think it's important to go with that initial idea if it has presented itself to you. I love those 'consequences' drawings. I've heard them called other things and somebody once told me that they were known as 'exquisite cadaver' drawings. I think that's such a great name, which conjures up all sorts of weird and wonderful images, so I'll be sticking with that. I made a few exquisite cadaver sketches, like the one above, to try it out. To see if it worked. I'll be honest with you, I think the trial run above is still my favourite. I guess that's because it was the most spontaneous. 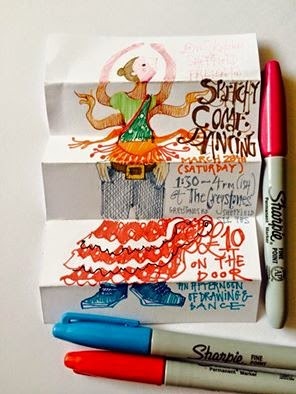 Then when I'd got one that I felt would work as a poster image I sketched it out onto a 'proper' bit of paper. I always add the image first, leaving room for the text. Sometimes I will play around with where I want to place the image. I did with this one - I tried her on both sides of the page and central before settling on this composition. For the text I always quickly research (Google) posters or fonts until I find something that fits. For example, I'll Google 'Bollywood poster fonts' or some such thing. This one was a combination of various fonts because of the variety of dance genres. When I find a font I like I loosely copy it. I don't measure out the letters, nothing technical happens, I just copy it by eye (is that even a saying? It looks odd now it's typed out). I don't want it to look exactly like the fonts I find. I want it to be my own version of them. Anyway, that's a little (ish) explanation of how I create my posters. Now anyone want a poster illustration? I'm for hire. I'm always for hire. The Jaguar E-type has recently been voted Britain's favourite classic cars in this poll. I was commissioned to produce a drawing of it. It's not surprising that it is in the number one spot as it really is a thing of beauty. I used pencil (a soft thick 4B) and marker pens, to make this drawing, both of which are drawing materials that I've recently started using. I've never been much of a pencil girl. It doesn't really do it for me, but I kinda like these soft pencils now and again. The marker pen has been a revelation and I can't get enough of them these days. I did all the darker tones and areas with the markers, and it struck me that at one point I would have filled all that in with tiny cross hatched fine lines. Just the thought of doing that, now, brings me to tears. You can see the rest of the list of Britain's favourite cars, and if you vote you can actually win this drawing HERE. A little while back I was asked why my book was more expensive in my shop as opposed to on Amazon. It is a good question. It is a fair question. I tried to answer it in an illustration. How else? It is an issue that faces all of us that run a small business. There's no way of competing with the big guys, no way at all, there is no point in trying. But we do have an advantage over them and that is the service we give. I am not making big bucks off my book, hell, I forgot to even mention, in this illustration, that I have to buy my book off my publisher in the first place - as well as the currency conversion and bank charges that that entails too. That's before the, above, process even begins. No, I'm just scraping by. Always just scraping by. But when you do buy from a small business or independent seller/artist you are also supporting them in creating their work. Thank you for that. I really don't mind where people buy my book from. It is an honour that they do buy it at all. I'm glad I was asked this question. It's an important one and it gave me the chance to try and answer it. 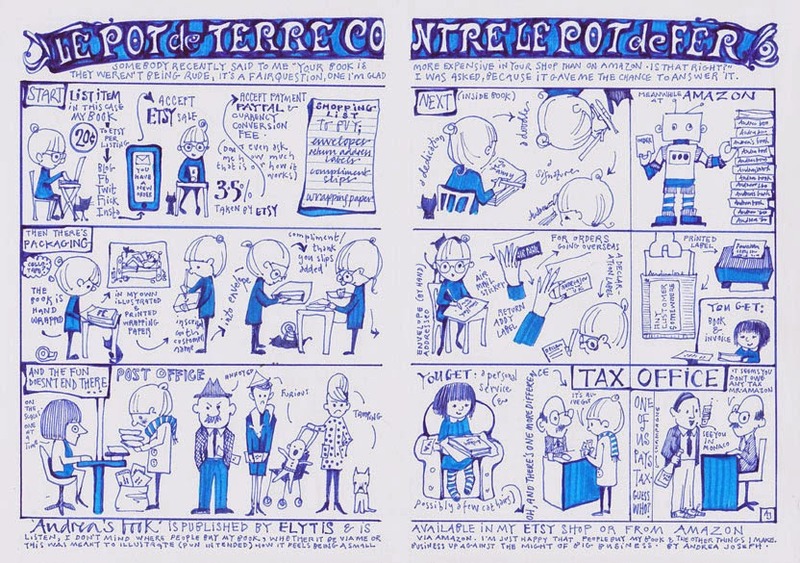 Quite coincidentally, I was chatting with my publisher, whilst I was in the middle of this drawing, about the price issue when he said "in French we say 'le pot de terre contre le pot de fer'. It's a kind of David and Goliath" and that's how this drawing got the title.